Morpheus Trading: Stocks sold off across the board on higher volume, with all major averages closing down in the -0.5% to -0.8% range. The higher volume produced a distribution day in the S&P 500, Dow Jones, and Nasdaq. Although it was technically a distribution day, most averages remain in good shape and have only pulled back to or undercut the 10-day moving average. An example of this is the current pullback in the S&P Midcap 400 ETF (NYSEARCA:MDY), which pulled back to support at $254 from the rising 10-day MA and the highs of the last base. Yesterday’s pick up in volume could turn out to be support, but we will have to see how the price action reacts to the volume over the next few days. Ideally, we’d like to see a one or two candle bounce higher beginning tomorrow, followed by a light volume test of the $254.50 – $255 level within a few days. 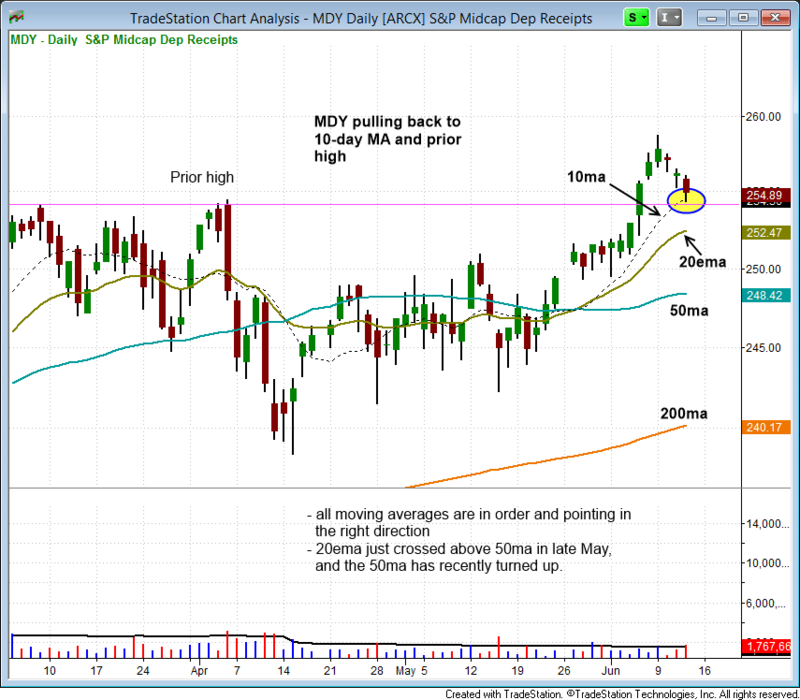 With $MDY, all moving averages are pointed in the right direction, so there should be enough momentum on the daily chart for the price action to hold above the 20-day EMA at the very least. A decisive break of the 20-day MA would be a clear negative for the price action in the short-term. Transportation ETF (NYSEARCA:IYT) was hit hard on big volume Thursday as money appears to be rotating out of extended names within the group. As mentioned yesterday, rotation is normal in a trending market, as long as new buy setups emerge. 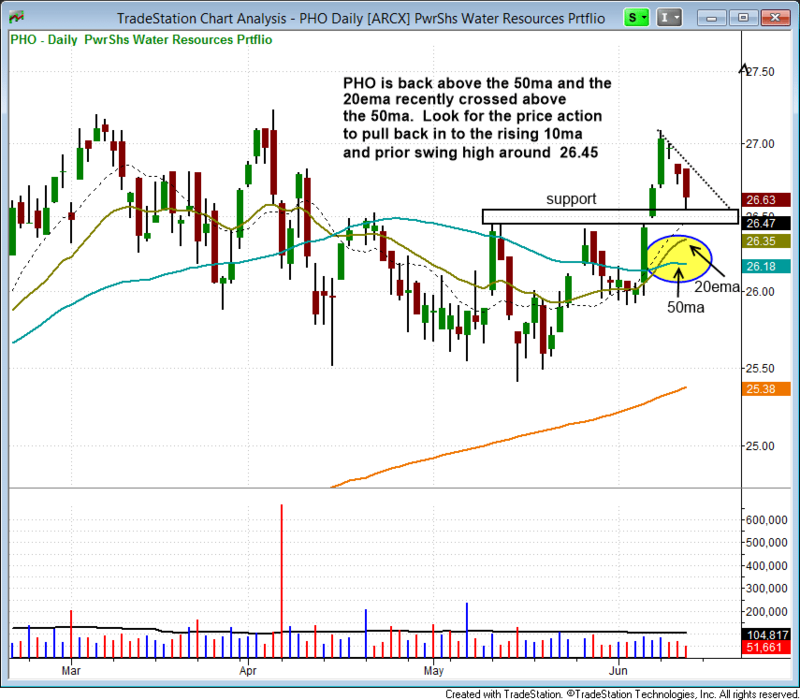 PowerShares Water Resources (NYSEARCA:PHO) has formed a bullish cup with handle type consolidation since stalling out above $27 in early April. After setting a higher low in early June around $26, the price action reclaimed the 50-day MA and pushed through the $26.50 resistance level with ease. $PHO is currently forming the handle portion of the pattern, and should hold above the 20-day EMA over the next week or two.